The February jobs figures, covering October to December, showed a UK employment market that is still strong, with unemployment edging downwards but annual total weekly earnings growth down from 2.8% to 2.6%. On that basis, total income from employment is up 3.7% year-on-year, supporting potential spending later this year. On the other hand, inflation continues to creep upwards, mainly driven by higher fuel prices. 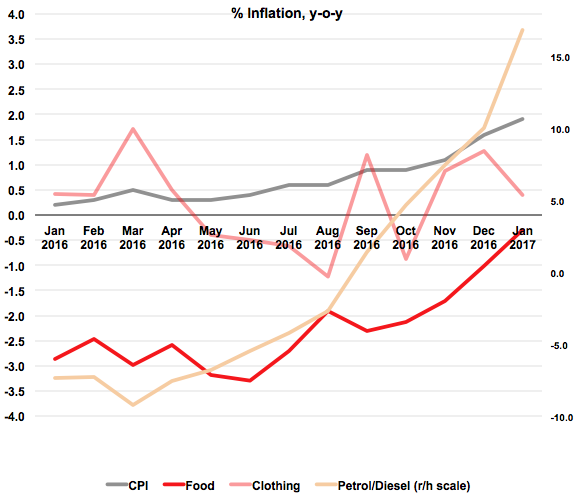 Food inflation is still in negative territory year-on-year, albeit heading upwards, while clothing, hit by increased discounting this January compared with the same month in 2016, actually showed a dip in inflation. Reports of tough negotiations between UK retailers and Bangladeshi manufacturers show that while many contracts may be priced in US dollars, retailers are seeing through this and are determined to strike a deal related to local currencies. For example, while the sterling US dollar exchange rate is down around 14% against its average value in the months before last June's referendum, it has fallen by only 12% against the Vietnamese dong and Bangladeshi Taka and only 8-9% against the euro and a similar amount versus the Chinese yuan. The effect of petrol and domestic fuel prices rises is real and will hit households in the wallet, but in non-energy goods, the speed and force of the impact of inflation is still very much in play and remains uncertain.